Through the 3rd grade I attended Central School and lived across the street from Wray Jr.High, which was a favorite place to rollar skate. Also every afternoon the ice cream truck parked there when school was dismissed. Before the 4th grade, we moved across town, and I started Victory School. I made dear friends, many of whom I'm still close to today. I remember 10 cent Friday afternoon movies, the yearly Christmas assembly with ancient films and Santa giving out candy on the stage, the cigar truck that made deliveries to Mr. Lingerfelt, and Halloween carnivals. I remember walking home from school, often stopping at Judy Kenley's house. Around the eighth grade age , we'd often gather on weekend nights in Judy Mauney's garage and play Spin the Bottle and Five-Minute Date. Innocent fun! I have such great memories from high school--Every afternoon and on Wednesday nights, we'd go to Hamp's and just hang out. ( How lucky we were to have such a place.) There were ballgames, dances, slumber parties and beach trips. Great friends and great times! At school our homeroom was always special -10th with Mr. Nelson, we bonded (Zerro); 11th- fun with Mr. Tester; senior- some of us had to endure Mr. Kilby, but still lots of laughs....Loved my homeroom buddies!.....One sad memory is when Jackie Craig died. I was just getting to know him, and then in one February night, he was gone. So unaccustomed to tragedy, I didn't know how to handle my feelings of grief. I don't guess any of us did. Walter Long posted a message on Doris Goodnight's Profile. New comment added. Happy Birthday, Doris. Hope you continue to have many more! Doris Goodnight Vlaservich has a birthday today. George Rawlings posted a message on Doris Goodnight's Profile. HAPPY BIRTHDAY! Hope you have a special day on the 24th. Doris Goodnight Vlaservich added a comment on Profile. New comment added. Doris Goodnight Vlaservich added a comment on Claudia Hill Conrad's Profile. Doris Goodnight Vlaservich added a comment on Profile. To one of my favorite people in the class of '60, happy birthday. You are the rock; the path you have created is a model for all. May you have many more. Jim Mauney posted a message on Doris Goodnight's Profile. New comment added. An early wish for a very Happy Birthday to a great longtime friend! Hope you have a great day! We're in BR, so can't see you on your special day, but know that I'm thinking of you! George Rawlings posted a message on Doris Goodnight's Profile. New comment added. Doris: I posted a Happy Birthday to you earlier, but I don't see it here. Oh well. HAPPY BIRTHDAY to you. Hope you have many more. John Beaty posted a message on Doris Goodnight's Profile. Happy birthday Doris We miss seeing you!! Walter Long posted a message on Doris Goodnight's Profile. Happy Birthday, Doris. Hope you have many more! Jim Mauney posted a message on Doris Goodnight's Profile. Happy Birthday to one of my best girl friends! Hope you have a great day! 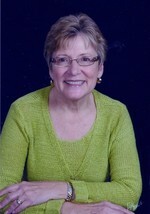 Doris Goodnight Vlaservich added a comment on Barbara Stephenson Edwards' Profile. Doris Goodnight Vlaservich posted a message on Barbara Stephenson's Profile. I and so many others are thinking of you and "the love of your life". We will keep you both in our prayers. If it weren't for church directory pictures, there would be none at all.